We have reviewed a selection of games which have been sent to us. These will enable the whole family to enjoy their leisure time - family games are great to enjoy and bring all ages together. Inside the box, you will find 100 brightly coloured cards, 42 tokens, a tilting deck, 3 base cards and those all-important rules (in 4 languages). The aim of the game is to encourage players to step into the world of stories and to use their imaginations to make up stories, invent characters and devise plots - it's a great way to encourage creative thinking skills and also to give children confidence in speaking and telling their stories to others. Draw two cards and start a new story, while the others guess which card you are going to choose by placing a key token in the tilting Story Chest. The winner is the one who made the most correct guesses. Each card can take the story into all sorts of different directions. There are fantastical beasts, fairy tale characters, strange forms of transport, animals galore and much more, all designed to stimulate the imagination. The game is suitable for 2 to 7 players, age 7+. As players increase in confidence - and their story-telling skills develop - more cards can be used to make the stories longer and more complex. A fun game which enhances a key skill; a skill children need but which does not always come readily. It works well for all ages - children's imaginations can be more vivid than those of adults! Buy from 365 Games. Is it a story or is it a game? It's both, with a colourful story book neatly brought together for an imaginative adventure. Roll the big wooden dice and turn over one of the puzzle pieces; the objective is to try and find the right pieces for your puzzle while keeping an eye on your opponents' progress too. It's very straightforward, even for the youngest players (recommended age 4+). The game is quite short, at around 10 - 15 minutes, we found it ideal for young ones. The story book, which links closely to the game, brings an added element and facilitates talk about the marine environment. Playing this game encourages matching skills and memory, as well as taking turns. Before the first game, children personalise the dice by adding the enclosed stickers - I'd be inclined to varnish over these to ensure the pictures stay on. An unusual and fun game. A perfect winter game! It's time to set off for the icy North Pole to see who can catch the most fish. To play the game, just move the colourful characters along their allocated routes, trying to catch as many fish as you can. There's a catch though - when you go to market, you will only be rewarded for one kind of fish on each turn. This is a really well produced game, with lots of attractive elements - game board, 6 3D icebergs, a polar bear figure, 18 fish tiles, 24 fish tokens, 54 cards and 47 cardboard coins. We loved the six playing pieces - each well-painted person is nicely made out of wood, and the special touch is the fur-lined hood. The rules look quite lengthy but they are in actual fact very straightforward and children will soon pick the game up; best to play with an adult initially, though - the game is suitable for 7+, and it's one the whole family (up to 6 players) will enjoy. It's colourful and enticing, and gives parents the opportunity to encourage finding out about the North Pole. I was immediately attracted by the retro feel of the box - lovely images. Players will quickly learn their way around Europe, and become familiar with its great landmarks, as they transport tourists in their coach between the famous cities and iconic sights, from the La Scala in Milan to the Arc de Triomphe in Paris, via many others. But this is business, and players have to contend with competitors who are equally keen to be successful. Strategy comes into play as players plan the journey; for each complete journey they receive points which count towards that important final score. Players are also rewarded for each new destination reached. This is a really nicely made game, with top quality playing pieces that are a joy to use. The game is suitable for 8+, for 3-6 players and lasts around half an hour; it's a good introduction for children to strategy games. There are lots of super new games reviewed here from Tactic Games; they are all great fun, ideal for the family to enjoy together, and they make excellent gifts - you can never have too many games to choose from! This is a nice take on traditional memory/matching games, with round cards neatly stored in a cardboard cube, perfect for taking out and about. The cards are visually very attractive, with images including spaceships and animal astronauts. The game has many benefits for children. including stimulating visual memory, focus, and concentration. The pack includes 12 pairs (24 pieces) and there are two ways to play. Younger children can find the matching pairs with the images facing up, and advanced players can find the matching pairs using their memory with the images facing down. A lovely gift for a party or as a thank you gift. Suitable for ages 3+. Mudpuppy creates award-winning children's toys, puzzles, and games that promote creative play and engage a child's imagination and education. "Available from selected London stores. For stockists, visit www.bertoy.com/dealers". Scroll to the uk map for shop lists. The aim of the game is to eliminate Romeo's Robot Army by using strategies to fight off the robots and power down Romeo's lab! Inside the box you get: 1 game board, 33 playing cards, Romeo's lab, Romeo's lab base, 15 robots with stands, 4 playing pieces and some instructions. Romeo's lab base has a numbered wheel on the side; when you start the game, the number must be set at 7 and during the game there are opportunities to move the number down, if you can get to 0 then you win the game. Each playing piece has it's own starting point at the beginning of the game and the pack of cards need to be placed face down in a pile. Each player or team then takes it in turn to pick a card, and each card will give different instructions such as moving Romeo, adding a robot, moving one of your characters or taking power away from Romeo's base. You always have to do the top action on the card and then you can chose which of the two remaining bottom actions you wish to do. There are 3 super power cards in the deck which give you a better chance of defeating Romeo's Robot Army if you draw them. As the game goes on you will be adding robots when instructed, eliminating robots as you move, moving your pieces to stop the robots and working out which is the best way to defeat the enemy. If Romeo manages to get himself or one of his robots to the PJ Masks HQ then you lose the game! This is a great game to play with children as it is competitive in the sense that you need to defeat Romeo's Robot Army, but even if you are playing in teams, you are all working towards the same goal so it encourages team work and discussion. The game helps children learn to think in a different way as they may not have used strategies before and they have to work out which out of the choice of actions is the priority and will help them win. It does need a bit of explaining before you start to play, if you are playing with younger ones it is best to explain as you play as they won't remember what all the different instructions are by the time you start the game. We played this a few times before our mini reviewers got the hang of it but once they did they really enjoyed it. The game says for ages of 4+, I'd probably say 5 and over is slightly more accurate as it can be complicated to understand why one action may be better than another action choice. Our mini reviewers are 7 and almost 6, the 7 year old played on his own team while I played with the younger one so I could explain as we went along. We liked this game as it's not actually easy, even with an adult playing! This means that children will want to play it over and over again as there is no guarantee that they will win and they won't grow tired of it. The game board, robots and Romeo's Lab are all made of sturdy cardboard and PJ Masks character pieces (Catboy, Owlette and Gekko) and Romeo are all very good quality figurines that you could put on display when you are not playing the game. 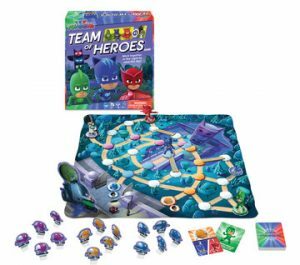 PJ Masks Team of Heroes game retails at £19.99 (at time of writing) and you can read more about it here. Be prepared for a head full of words with this fun game - your brain will be spinning! The teams take it in turns to take on the one-armed Bandit across different categories to find words, names, celebrities and more. Children will love playing with the wacky one-armed bandit, which offers a really fun element to the game. The great thing is that the game features four easy word games, giving plenty of variety and making the game good value. The game can be played in two teams of any number, or by two individuals; we found it worked well to play as teams initially, then children are happy to play on their own once they have grasped the rules. The game uses from one to four rows of random letters to either find famous people, think up words in well-known categories, find things that ‘begin with’ (such as boys’ names) or spot short words spelled out by the letters on show. If the face of the Word Bandit appears instead of a letter then your team has one letter less to play with on that turn! The rules are easy to follow and there's a sand timer included so nobody takes too long over their go. With lots of different ways to play, you can choose just what will suit your family. More answers mean more points so the aim is to be as quick as possible and race round the board to win the game - and we found that children can be quicker than adults! The game is suitable for players of 8+. It's a super game for the family to share and an excellent way to develop children's vocabulary and thinking skills. Drumond Park would love to hear how you get on through social media using #wordbandit. Just the title is enough to make you want to know more! To play the game, players roll five dice and use the letters to create taglines for some of the strangest products on the internet - and there are certainly some strange products here! The rules are simple - just a double-sided sheet, so no lengthy setting up. Cards are placed on the table, a judge is chosen, then the rest of the players (3 to 20 can play) have to write a one sentence advert for the product card from a selection of over 120) randomly selected by the judge...but they must use the five letters shown by the dice to start each word. Then the judge chooses their favourite. Then it's on to the next round, with the winner as judge, until a player has won three rounds. What kind of advert will you write for a Bulletproof Onesie; Sudoku for Simpletons; a Household Pet Communicator or Edible Hair Conditioner? As well as the five dice, the pack includes mini notepads and eight pencils, which is really useful to save hunting around. The game is created by Germany's most prolific card game designer, Reiner Knizia. and is one of the brand new party games by Big Potato. The fact there can be so many players makes it great for parties, and it certainly gets you thinking - and laughing at some of the weird and wonderful products. It doesn't get boring either - every game is different, as each depends on the throws of the five dice. Great fun and generates lots of hilarity. Oh no! The Fox is in the hen house, snapping up the chickens and stuffing them into his capacious pockets. But there are hilarious consequences - when there are too many chickens, his baggy green pants will fall down, triggered by pressing on his head, and the chickens will escape! This is really fun and very effective as the chickens fly out. And then there's a scramble to pick up as many chickens as possible, using one hand only; the winner is the first to collect five chickens in their coop. This highly entertaining game which will be a real hit with children is suitable for up to 4 players, aged 4+; it's definitely one which appeals to a child's sense of humour and the element of suspense is just right for the age group. There's an added element of fun in that the starting player is decided by who does the best chicken impression. The cartoon style characters are great fun too. The game is very simple and quick to play and children will happily play with friends as well as with adults. It's great for developing quick reactions and you can be sure of plenty of laughter. Not one game but over 100! Playing games together is a great family activity, making the most of that precious time we have together. This book is packed with unusual and engaging ideas for all manner of games, suitable for a wide age range and situations, quick games and longer games - just take your pick. In The Floor is Lava there are games to start a party, ideas to trigger conversation, story-telling setups and fiendish puzzles, plus physical challenges, activities to soothe a weary brain and plenty more. To whet your appetite, here are a few of the games - Squiggle Challenge; Murder in Paradise; Hardest Game in the World; Reflect Me and King Henry VIII's Banquet. For less than the price of many board games, here are 100 games for home, journeys and holidays. Great fun and full of unusual and interesting ideas. This is an ideal introduction to memory games for young children and they will love the familiar characters, which will make the game easier to play initially. The 48 colourful cards feature Gru and his adopted daughters Margo, Edith and Agnes, Lucy and the hilarious minions, plus the characters from the new Despicable Me 3 film. The object of the game is to match and collect 24 pairs of bright and colourful high-quality memory picture cards in this classic game. This game is suitable for 2-6 players, ages 3 years and up. It is a fun picture matching game which is a great way to develop matching and memory skills - the children often do better than adults! You can extend the value of the game and help children's discussion skills by asking them what they know about the characters - and even ask them to play out scenes from the series. A great value game which is perfect to take when travelling and visiting. There are many more in the range (including The Gruffalo as shown here) - look out for them and see them on the Ravensburger site. With so many to choose from, you are bound to find a favourite for your child. As a family, we love Smart Games, and adults vie with children to be the first to play. They offer a challenge to all ages with the progressive increase in difficulty levels - Squirrels Go Nuts! offers 60 challenges from starter, junior, expert, master and finally wizard. Winter is on the way and it's time for the squirrels to stock up on nuts for the harsh days ahead. Slide the four adorable squirrels around on the board and hide their acorns underground. Setting up the game is simple - just place the squirrels and acorns on the game board as shown in the challenges in the colourful instruction book. Then you slide the squirrels horizontally and vertically around the game board, dropping all the acorns into holes; the puzzle is solved when each of the squirrels have dropped its acorn into a hole. If you are really, really stuck, visual solutions are included - but don't give up too soon and spoil the fun as it's surprising how returning to the board after a few minutes break can suddenly reveal the solution to you. Planning, logical skills, problem solving, concentration and spatial awareness - so many skills are developed by this superb game. It's ideal for playing on the go, as the puzzle pieces sit inside the base, which has a secure plastic lid. Watch a video here. Another sure-fire winner which will provide many challenging and enjoyable hours for all ages. This is a great contrast in subject matter to the game reviewed above and it's great to see it will catch the eye of a different audience... although both games have universal appeal, of course. The challenge is to safely steer your spaceship through an asteroid field. Asteroid Escape is a galactic 3D sliding puzzle and there are 60 missions to be achieved, ranging between starter, junior, expert, master and wizard. This gradual building up of skills through 60 challenges is excellent, as players never feel too daunted by the challenges if they have progressed through the levels; it's what makes the game suitable for such a wide age range too - age eight to adult. To play, you place the eight puzzle pieces on the game board as illustrated in the instruction book, then slide the puzzle pieces around the board so that your spaceship can escape with no asteroids blocking the way or obstructing its wings; the 3D aspect of the pieces adds an extra challenge as some pieces cannot overlap. Problem solved when the spaceship can fly off the game board - the spaceship is the only piece that can fly off the board, due to the design of its base. Solutions are included which show the shortest possible route - see how you compare! Smart Games are so beautifully manufactured and they are a real joy to play with. These one player games, so great for those who want a challenge but can't find an opponent at that specific time. See a video on how to play here. Smart Games are so well though out, from development to neat portable packaging. |Another superb game which will be much played as skills develop - these skills include spatial awareness, forward thinking, visual perception and more. And it's all great fun. This is a redesign of this family board game; a game that has proved very popular. The challenge is to perform a variety of noises, actions and activities. The categories are: Who am I? where the player pretends (soundlessly) to be something such as a ballet dancer, aeroplane, cat and so on; Make a noise, perhaps humming or an animal noise; Actions - do what is written. Then everyone else has to guess. With over 300 hilarious challenges there is plenty of variety in the games, meaning they play out differently every time - and for even more variety and suspense, the magic decoder reveals hidden forfeits. This fast-moving game is excellent for having plenty going on all the time to keep players fully engaged. The aim is to be the first to reach the 'Finish' star in the centre of the board... and you get there by making noises, performing actions and making mimes; to add to the excitement, some of the actions have to be performed within a set time, using the sand timer - this is another way in which the child-friendly appeal is enhanced. If you can't perform your action, you have to perform a forfeit. What a Performance! is suitable for ages 5+ and for 2 or more players. It's not a game for the self-conscious, but for that very reason, it's an excellent way to build up confidence in a safe and reassuring family environment. It's great for developing maths and literacy skills too, and it also encourages activity as some actions need to be performed, such as touching toes and hopping. A great family game which is fun for all ages - we really enjoyed it. This is an excellent game for developing those all-important memory skills - all the family can benefit! Four fun child superheroes with special powers are the stars of this game - perfect to appeal to young children (recommended age 3 - 7). Players need to employ their memory skills to match power tiles - the winner is the first to complete his or her board. Players must talk about the interesting items as the game plays out; this is perfect to develop vocabulary and conversational skills. 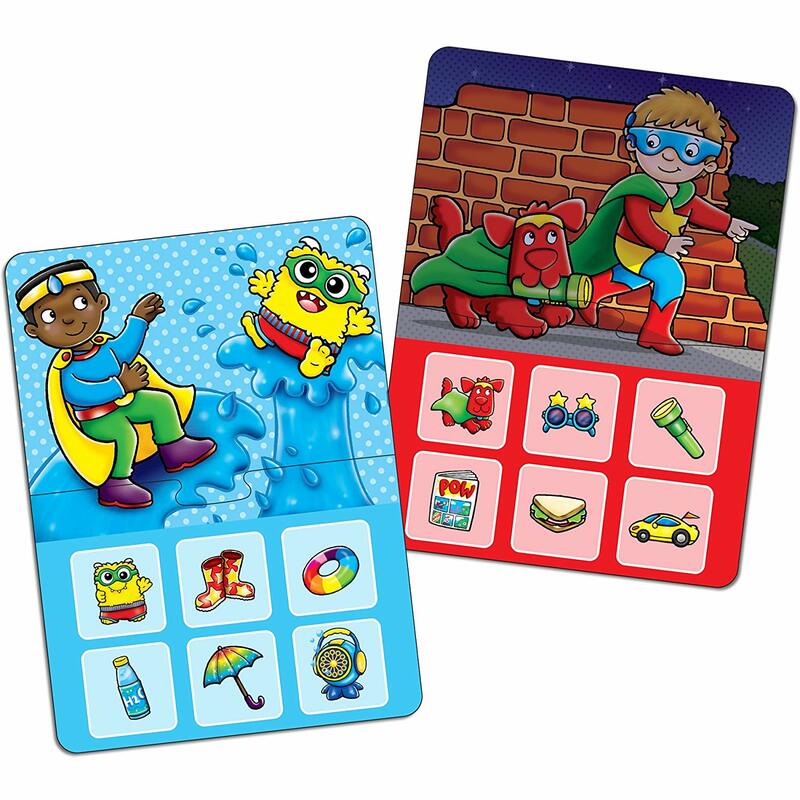 The double-sided lotto boards include fun superhero fact files on the reverse, as well as blank tiles for a more challenging level of play; this is great as it means children will enjoy the game for several years. A lovely, colourful and fun-filled variation of the classic game, manufactured to all Orchard Toys' high standards. There are plenty of educational benefits, including the development of observational skills, matching and memory skills, and personal and social skills. There are some activities to enjoy on the Orchard Toys website. Quick reflexes, sharp recognition skills and mental fortitude are all attributes which will pay dividends in this game of tile-snatching .Players take turns rolling the dice (featuring six different symbols), spotting the tile with the matching pattern, then grabbing it before their opponents. The first player to grab six tiles wins the game and bestows honour to the Grand Shidoshi, Master Meow. The pieces are well made and a pleasure to play with. "The Cobra Paw tournament derives from an ancient stone-snatching game called Clawfuku, believed to have been invented by a mysterious rogue known as Phee Lion." It's a quick game to play - we found about 10 minutes on average; it suits players of 6+. Very simple and fast-moving, it can prove very addictive! Thank you to the Blogger Board Game Club for our sample. 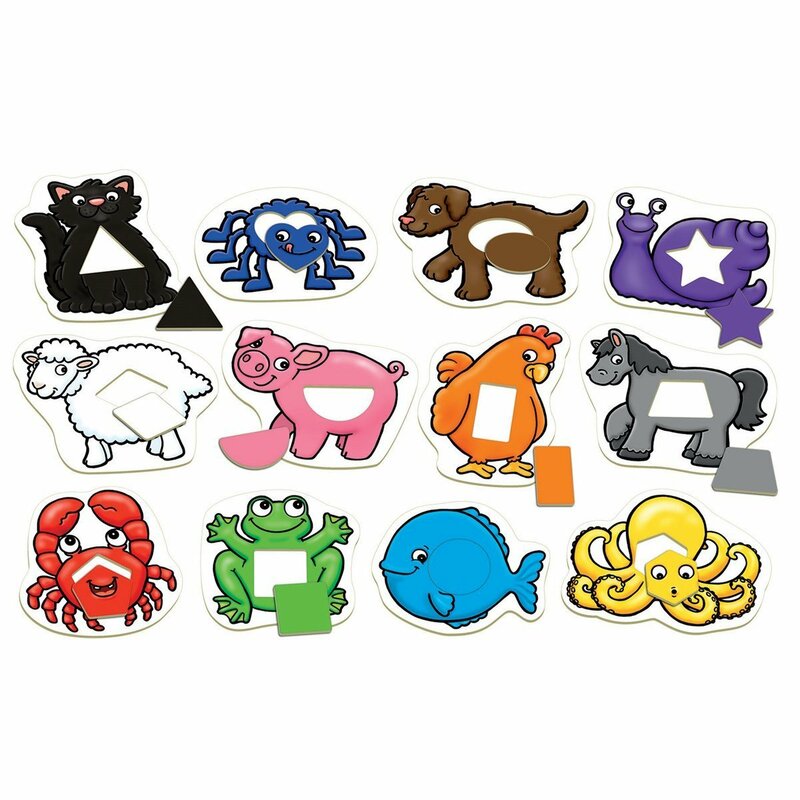 Dobble Animals is a new addition to the highly popular Dobble range and will especially appeal to children - it's recommended for age 6+, but we found our 5 year old could compete on equal terms with others. The game is suitable for 2 to 8 players, making it ideal for families or for children's get-togethers. It's a fast-moving observation game, rather like an enhanced and more fun version of Snap. Players have to be first to match an identical animal between the cards, shout 'Dobble' and put their hand on the card; each has a number of different animals and there's only one shared animal (out of eight) between any two cards. The tin comes with 55 colourful and attractive circular cards and a set of rules which includes variants on the game. The game encourages fast reaction skills and observation. Some matches are really easy to spot, others offer a little more challenge, which keeps interest high. The neat packaging makes the game ideal for taking out and about, and with 15 minutes average play time, it's great to fill in those odd moments. There are many versions of Dobble, so look out for topics that really interest your family. Thank you to the Blogger Board Game Club for our sample - we really enjoyed it! Concept is a board game by Alain Rivollet and Gaetan Beaujannot The aim of the game is to guess words through the association of icons. Players use the icons on the game board to convey words or phrases to each other visually without the use of speech or sounds. or speech. Players take it in turns to convey a concept then the rest of the players guess at it. One point is awarded for conveying a word or phrase clearly; two points for guessing one correctly; you can choose to allocate more points for more difficult concepts (these are labelled on the cards as 'easy', 'hard' and 'challenging'. The first player starts by taking a card, which gives nine words or phrases from which to choose. Start by placing the main concept pawn on an icon that indicates the core of what the concept is. Some concepts involve more than one line of connected ideas. In that case, sub-concept pawns and cubes of the matching colour can be used to indicate a secondary descriptive idea. Concept is best played with a minimum of four players. The game ends when a player or team has collected twelve lightbulb-shaped victory points...or you can just keep going as long as you like. The game includes 110 cards, a game board, 39 tokens, 47 plastic pawns and a storage bowl. The combining of cards allows for hundreds of different words to be suggested, so you are unlikely to get bored. However, the game does offer plenty of flexibility and once you have played the basic game a few times, you may like to introduce your own variants; these can make the game more suitable for children, for instance. We decided that the very artistic could draw their own cards. Concept is suitable for ages 10+ and between 4 and 12 can play; players can compete as individuals or in teams. It's great that so many can play as it makes the game perfect for parties or freinds and family get-togethers. The average length of a game is 40 minutes. The principles are rather like charades, so if you enjoy charades, you will love this... and it's better than charades for the more shy player! The use of icons means that younger players will find the game easy to play and all members of the family can play on equal terms. A really innovative game which makes a refreshing change from many on the market. We loved it! The aim of this games is fairly simple, but a lot of fun! The box comes with a whopping 133 brightly coloured pieces and you can use the colours in order you like to make your tower. 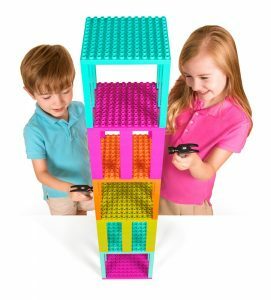 To build your tower you first need two of the platforms and lay them together side by side, you then need to make six columns which should be four bricks tall; start by making a column in each corner and then add a column in between the two corners. You need to alternate the direction of the platforms for each level. Now it's time to play! In the box you will also find a hammer, each player takes turns to hit at a support column. Sometimes a whole column will fall out and sometimes just one or two bricks will fall. You don't want the tower to fall over when you hit the support columns, therefore the person who manages to knock a brick out without toppling the tower, is the winner! 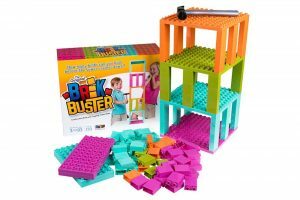 Brik Buster encourages creativity and learning through building. You can build your tower back up and play can start again within a few minutes. My mini reviewers played six games in a row as they got more competitive as they worked out their own strategies for winning. It is suitable for ages 3 and over and for two or more players (children and adults). 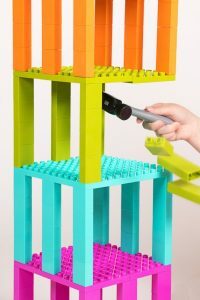 Strictly Briks are also compatible with other major brands with large bricks such as Duplo and Mega Blocks which means you can add to this set and play your own variation of the game. Who can resist a game packaged like a banana? The bright yellow zip-up bag has immediate appeal and it is perfectly portable, making this a game for any time, any where. It would make a great stand-by for the car - keep a set in the car and unscheduled stops or planned visits will have an extra element of fun. There are 144 lettered tiles and these are placed face down on the table to start. Each player takes a certain number of tiles (the number depends on the number playing) and the objective is for each player to create their own interlocking grid of words using all their letters. When a player has used all of their tiles, they call out "Peel!," and each player must draw a new tile from those remaining. This is where the game really gets challenging as you might have to rearrange all your letters into new words.If you get really stuck, you can swap a tile... but you have to take three in exchange. Play continues until all the letters are used up, and the winner is the one to use all their tiles up first. It's great because there's none of the frustrating waiting around that you get with games like Scrabble - every player is working out his or her own words at the same time. Great fun for all the family - but I really like My First BANANAGRAMS for younger ones for the way it teaches word sounds as well as letters. BANANAGRAMS is simple to set up and really easy to play; it will increase vocabulary, especially if you allow the use of a dictionary which may slow down the individual (but that's a matter of choice) but does wonders for the vocabulary and spelling. The pack also suggests some alternate games and BANANAGRAMS can also be played by one person - a great way to hone your skills ready for competition! A simple but amazingly effective game which is fun for everyone. Thank you to the Blogger Board Game Club for our game. We live in a society which increasingly makes less use of cash, but it's still essential for children to experience handling money - and games are a great way to do this. Money Match Cafe is the perfect educational game for 5-8 year olds, developing skills in addition and money handling...with lots of imaginative play added into the mix. Ideally, to enjoy the game to its best, children will already have some knowledge of money. There are two different levels of play, which extends the value of the game, allowing different ages to enjoy it together. The game is played by creating a cafe scene, for which children use their own teddies, dolls and other toys. Then it's time to use their addition skills to add up the coins to match the price of a meal and their roleplay skills to ensure they serve the meal to the right customer. The player who serves all his or her meals first (and correctly, of course) wins! I love the way the game extends to include children's other toys - it really does add so much value to the game. It also encourages collaborative play - I can see plenty of ways to use the game in a class setting. They might find some clothes for themselves in the dressing up box too - even just an apron or head covering will add enjoyment and realism. The box includes 4 3D tables, a spinner, a till board, a tray board to deliver the meals, 16 meal/beverage/snack cards (attractively illustrated) and 32 money cards (16 easy cards, 16 hard cards). Children can be encouraged to use the game alongside their collections of play food to extend the play value and learning opportunities. The combination of pretend play and a fun game is a real winner and the educational benefits are many. Best of all, children really enjoy it! Buy from Orchard Toys. Hands-on learning is so often the best; we can encourage our children to do workbooks about money (and these certainly have their place) but playing games is much more fun and will really instill the principles in a way they will remember - and they will see it as fun. This fun shopping board game will teach children about handling money and giving change as they travel around the board from shop to shop, using pretend money to buy all manner of different items. The rules are clearly explained and simple to follow, so there's no lengthy setting up or explaining to do; the winner is the first to collect all their six allocated items - but beware! You mustn't overspend. Role play is a key part of this game, as each player takes it in turn to be either shopper or shopkeeper. Players travel around the board, visiting the correct shop to purchase their items. Of course, they will need to greet each other politely, so the game also encourages polite conversation and increases vocabulary. Great experience and confidence-building for real-life shopping. Familiar shops and objects are used, including a market, bakery, newsagent and greengrocer. The game includes a game board; 48 item cards; 4 shopping bag boards; 4 characters with stands; play money; dice and instruction leaflet. It's good to know that the instructions are always available for download from the Orchard Toys website too. This is an excellent game, fun to play with lots of educational value; it's one children will enjoy playing over and over again. Buy from Orchard Toys. This game instantly intrigued us, as it looked totally different to anything we had previously experienced - and we weren't disappointed! Stuffed Fables is an Adventure Book Game in which all the action takes place in the unique storybook - a book that acts as your rules reference, story guide, and game board, all in one! The book opens flat onto the table to reveal a colourful map or other illustration integral to playing the game, showing the choices, story, and special rules on the opposite page; each adventure goes over several pages. The game is based around a group of stuffed toys who have sworn to protect the little girl that loves them from a scheming, evil mastermind - players take on the role of stuffies - the stuffed animals which belong to the little girl.. In this action-packed game, players take and roll five colour-coded dice and then have to carry out actions from a wide range as defined by the colour, including melee attacks, to leaping across conveyor belts, or steering a racing wagon down a danger-filled hill. It's all exciting stuff - and the black dice hold an added element of danger as they represent minions who can attack the stuffies.When a player is damaged, they lose stuffing from their character. If they lose all their stuffing, they collapse immediately. Dice can be used immediately or kept for later, bringing in a strong element of strategy and a need for forward-thinking. Stuffed Fables delivers an exciting narrative adventure which is driven by player choices. Players explore a world of wonder and danger, unlocking unique discoveries as they interact with the story. The game is recommended for age 7+, although we felt that perhaps players as young as this may not have the patience and endurance for what can turn out to be a lengthy game - be warned, you do need to set aside an hour to an hour and a half. It is suitable for 2 to 4 players. There are lots of parts and they are all very made and satifsying to use: 23 finely detailed miniatures (I am very tempted to get my paints out and paint these! ); 35 multicolored dice and 1 dice bag; 6 unique character cards; the large 100+ page storybook; a sideboard; 29 lost, 10 sleep, 47 item and 40 discovery cards, plus counters. The storybook is excellently produced, with superb colour photos. Stuffed Fables is a good family game, inspiring a sense of wonder and revisiting key events linked with childhood. A fascinating game, full of surprises and one that plays out very differently every time. We were sent the game to enjoy as part of our membership of the Board Game Blogger Club. This is a lovely dominoes game with a difference - after all, the plain dots can get a bit boring! Now children (and adults) can enjoy a hilarious herd of llamas who are the stars of this game. From Llama-nardo da Vinci to Super Llama, players must match heads to tails to complete the chain and win the game. The sturdy and colourful cards are packed in a good quality card bix which flips open. The gane is a good way to develop matching and fine motor skills while having family fun. An unusuak and appealing variant on a classic. Latice is a strategy board game for 2-4 players or teams, age 6+, so great for family groups. The objective is to be the first to play all of your tiles. Match the tiles by colour or shape and on two, three, or four sides to earn extra moves. The wind tiles can be used to shift other tiles on the board. It's good that the rules are simple to start with, ensuring you can get on with the game quickly; but as you progress, the strategies become deeper and more complex, so you are always learning and progressing. The makers claim 3 minutes to learn, 20 minutes to play, a lifetime to master. As players become confident with the game, they will plan their turns in advance, keeping attention high throughout as they strategically use the board and wind tiles, playing both offensively and defensively based on knowledge of remaining tiles - it keeps you on your toes and ensures you have to concentrate. Latice develops cognitive, spatial recognition, planning and interpersonal skills for all ages. Interestingly, the game is colour-blind accessible through patterns on the tiles. The game includes 84 acrylic tiles, game board, 4 tile racks, 32 acrylic stones, box and an 8-language instruction booklet; all the pieces are well made and a pleasure to play with. There is the opportunity to play online with the free iOS app. It's a great game for all ages, ideal family fun and promotes some important key skills at the same time. We really like the way your game skills grow and every game is different. Bubble-making toys have a perennial fascination - few of us can resist, child or adult. I know I can't so we were thrilled to be asked to review this super toy which is perfect for the warmer weather, offering plenty of outdoor fun and an ideal ice-breaker for parties and barbecues. Experience the first game of its kind that blasts your opponent with bubbles! There's plenty of fun and excitement as you bounce ping pong balls into your opponent’s side to score points and blast them with a Gazillion bubbles if they lose. The first person to score three times wins. There are four levels of difficulty meaning Bubble Pong is fun for the whole family - although the children are often better anyway! It's a great way to develop quick reactions. Finished playing? When you are ready for a break, you can simply turn on bubble machine mode for a non-stop bubble party for everyone to enjoy. Bubble Pong includes a colourful plastic game console, six ping pong balls, two removable trays, two removable bumpers and an 8 oz. bottle of Gazillion Bubbles Solution. We found the bubble solution to be really good - the bubbles last well, lots are produced and they are a good size. Gazillion Bubbles are top quality bubbles and are available in both original and Big Bubble solution. Bubble solution refills come in 8oz, 2L and 4L bottles and they are definitely recommended. You can buy more - Gazillion 36182 2 Litre Giant Bubble Solution . Two AA batteries are required, and these are not included. Appropriate for ages 3 years and up. Also new to Gazillion for 2018 are Gazillion Crazy Wands. We had a wonderful time playing with this and it's a toy that will be used lots with all different ages and on a variety of occasions, with the added value of being a bubble machine too which really extends the play value. More information can be found at www.gazillionbubbles.com. In Hey, That's My Fish!, players want to catch as many fish as possible with their penguins. This is an engaging family strategy board game which is played in just 20 minutes so it is guaranteed to keep the attention of even younger members of the family (it's recommended for 8+). Each turn, a player moves one penguin in a straight line over hex-shaped ice tiles with 1, 2 or 3 fish on them. The player then collects the hex from where the penguin started its movement from the table, thereby creating a gap which penguins can't cross on future turns. When a penguin can't move, it's removed from play with its owner claiming the tile on which it stands. The player who collects the most fish wins. The game is really well made and the pieces are a delight to play with; it comes neatly packed in a storage box which makes it ideal for travel. A good introduction to strategy games which is easy to play. With 60 hexagonal tiles, there is plenty of opportunity for every game to be different - it can be very addictive! Good fun. In Splendor, players lead a merchant guild, investing in mines, sending ships to the New World and recruiting artisans. Glory and pestige are the aims of the game. Using tokens representing gemstones, you will acquire developments which give prestige and produce new gems (bonuses). These bonuses reduce the cost of your purchases and attract noble patrons to give greater prestige.The first thing that struck us with this game is the excellent quality of the graphics - the playing pieces are really attractive and make the game enticing before you start. The manufacturer claims that Splendor can be explained in five minutes but we found the rules took quite a bit longer to assimilate and then explain to everyone - so much, in fact, that we put the game aside first time round as we all wanted to get going. However, when we did persevere with learning the rules, we found it well worthwhile. Each game take around 30 to 40 minutes and it works equally well with two, three or four players. There's just one action per turn, so no boring hanging around while other players have their go. The first player to reach fifteen prestige points by accumulating nobles and development triggers the end of the game. There's plenty of opportunity to play strategically and we found this element increased after the first game or two, as the rules became familiar; every game (so far) plays out very differently. The game consists of 42 tokens in assorted colours plus 5 gold joker tokens, 90 development cards; 10 noble tiles and a rules booklet; recommended age is 10+. I like the fact the game is good for two players, as many seem to be better for more players; the element of strategy keeps you thinking and the premise of the game is unusual. Great fun. As a family, we love the original Ticket to Ride, so I was thrilled to be asked to review this version for younger players with my young testers. This is suitable for two to four players, ages 6+, and the children were pleased to have their own version of the adult game - one pf my testers is almost 5, so we played as a pair initially but she soon picked up the rules and was telling me what to do! The rules are simple to understand and easy to set up; it's relatively quick to play too - we found the children were able to concentrate fully throughout the span of the game, which took us 25 - 30 minutes. Players take plastic trains, train cards and ticket cards and the aim is to connect those two cities with a path of trains in order to complete the ticket. THe rules are clearly explained on a double sided sheet with colour illustrations to show the process - really good to help children understand. Ticket to Ride: First Journey is the perfect introduction to the Ticket to Ride series, which is hugely popular, and deservedly so. 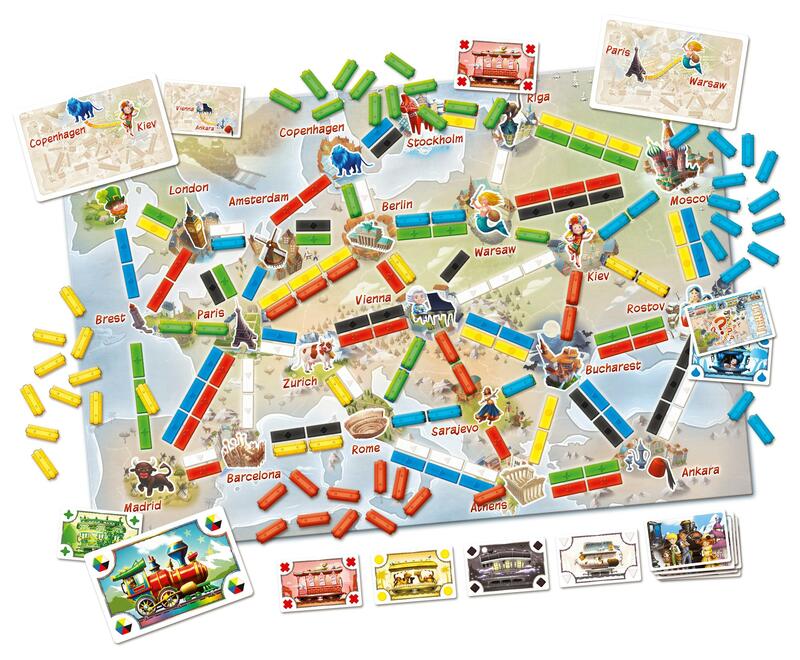 The aim of the game is for players collect train cards, claim routes on the map, and try to connect the cities shown on their tickets to achieve victory. The game board is a map of Europe with capital cities marked, so children will be picking up some geographical knowledge on the way - savvy parents will make sure they teach the names of the countries too. All the parts are well made and enjoyable to use. The game has been well thought-out to appeal to children and we found it really satisfying to play, with plenty of variety from one game to the next. A great game, highly recommended. We were sent tis lovely game as part of our membership of the Bloggers' Board Game Club - we are really enjoying the opportunity to try out a range of games. Quick reactions are everything in this fast-moving game that can be played on equal terms by adults and children, making it great for family fun. Speed and hand/eye co-ordination are needed, and these useful skills developed, in this fast, frantic stacking game. The objective is to race your opponent to clear all of your cups. The rules are simple and the game very quick to set up. We like the fact that it's not the youngest who starts (that gets boring for an older sibling) but the player whose colour shows when the button on the spinner is pressed. The cups have to be stacked according to the instructions. When the base colour of your cup matches the top colour of one on the podium, you must stack it quickly, before your opponent takes your chance. There's no time to relax though, as the game moves on quickly... ! The pack contains 32 brightly coloured Staccup cups and bases and a podium stand spinner. I have seen stacking games played in schools, so any child lucky enough to have this at home will have a head start when playing at school. Staccups is suitable for 2 to 4 players age 8+, although we found a 6 year old was fine with it.Beware - the game can get very competitive very quickly - but that's all part of the fun! It's addictive too - we really wanted to get better and better; there's an advanced game for an extra challenge. A great game with traditional values, that draws the family close while having fun. This hilarious drawing game with a difference is a great ice-breaker for parties and family occasions. It challenges your vision and perception and leaves you googling for more! The box includes a pair of wacky glasses and three sets of vision-altering lenses - easy, medium and difficult. The lens to use is ordained by the colour spot on the board. Also included are a timer, paper pad and pencil Always useful to have one in the box, to save hunting around), board, counters, dice and word cards. There are 54 Challenge Cards, divided into three themes - objects, places and entertainment - with 162 Challenges altogether. It would be very easy to make up your own challenges too, to extend the value and variety of the game. To play the game, set the timer then start to draw what the card says while your team tries to guess what you’re drawing. It's really tricky to draw when wearing the glasses and the results can be unexpectedly hilarious - as can the guesses. Is that an igloo or a turtle? A birthday cake or a fortress? Players (between 4 and 16) are in teams, and they take turns drawing and guessing, so everyone gets a chance to wear the glasses, which have interchangeable lenses. The timer is set to different times, according to the difficulty of the challenge. For an extra challenge, one spot on the board requires the player to draw with their non-dominant hand. A fun game that lets players of different ages and skill levels compete on equal terms, since the goggles make it fun and challenging for everyone. The rules are simple to understand and the game suits the attention span of the younger players - the game is recommended for 7+. Great fun for all the family and very entertaining throughout, keeping everyone involved. This is a great ice-breaker for parties and family occasions - nobody will be able to keep a straight face! It's simple to play and is great for any age (recommended for 7+ up); up to seven players can play and it can be played as a team game. Once you have read the instructions through and played one game, it's all very clear and straightforward. Just pick a card and imitate the emotion shown on it. The cards depict a range of amusing creatures, each showing an emotion; the emotions can be shown in one of the three ways - sound, facial expressions or a combination of the two. It's up to the other players to guess which emotion you were trying to show. More experienced players can progress to the Secret Message game, adding another level of interest. It's a well-made game and all the pieces are a pleasure to use, as well as appearing to be very durable. A hilarious family game which is fresh and interesting every time you play. Learn about the beautiful world of the coral reef whilst enjoying this fun game. Look for the marine animals shown on the two cards and point them out at the same time; everyone plays together, so there's no time to get bored and disengaged from the game, which is great for young players - the game is recommended for age 4+. The first player to point out the animals each time is rewarded with an animal figurine. These are a gorgeous part of the game - colourful and pretty tactile playing pieces which represent a wide range of creatures. Use these pieces to further an interest in the wonder of coral reefs, by looking up and discovering more about each creature. To make the game one to play over and over again, the double-sided game board, consisting of giant puzzle pieces, is different each time. The game takes around 20 minutes to play - perfect for younger ones; it helps develop visual and memory skills. A well-made and really attractive game to play; very enjoyable. We love Smart Games in our family - they come out over and over again. This single player game is suitable for ages 4 to 7 and offers 48 multi-level challenges; it's great that the game is designed for younger players, as they will have such fun, while developing essential key skills. Can you help the seven dwarfs find Snow White? There are two different formats - 24 challenges each from the interior and the exterior of the house. which progress in difficulty, giving children a real sense of accomplishment. The game includes a colourful 3D dwarf house plus Snow White, the Wicked Queen and the seven dwarfs; these are all beautifully made and very satisfying to play with. To play the game, find the correct position for each character, then open the doors and windows to the colourful dwarf house to see if you are correct; the levels are all shown in the instruction booklet. The fun is limitless with this enchanting game. Added value is provided by the picture book included, which tells the story through pictures, encouraging children to add their own words., thereby developing speaking and story-telling skills. The game helps develop spatial awareness, problem solving, thinking and logic skills. Even though Smart Games are single player games, for those who like a competitive element, the opportunity to see who can progress most quickly through the levels is irresistible! Great fun with loads of educational value. You can buy direct from Smart Games here. It can be hard to find stimulating toys for 1 to 2 year old children, but Orchard Toys has done well with this one. This is a simple first colour and shape matching activity which introduces children to a range of colourful animals. It is designed for children aged 18 months and over. It's simple and intuitive - just slot the correctly matched shape into the space to complete the animals; the bright colours and appealing animals will really attract young children. Each of the 12 colourful animals has a press-out shape in the centre to be matched up - these are all different. There are all sorts of ways in which the pieces can be used to develop matching skills, improve hand eye coordination, manual dexterity and encourage discussion - no doubt every parent (and child) will have their own ideas. Examples would include memory games, identifying shapes when turned over, and grouping pieces by colour. The thick chunky cards are durable as well as being easy to grasp for little fingers. Buy from Orchard Toys. This good value set incorporates two games of lasting popularity whilst giving them a fresh and magical new twist. Simple to set up - just join together the 6 jigsaw-type pieces to make the board and you're ready to go. In Fairy Snakes & Ladders, players must race to the enchanted treehouse - but will they be sent up the rainbows or down the rope ladders? Flip the board over and it's time to gather counters at the fairy ring in the game of Ludo. The games are recommended for ages 5 - 9, but our 4 year old tester played very happily, so I would put the age range a little younger. Who, out of the friendly fairies and unicorns, will be your child's favourite? This fun family board game has plenty educational benefits; it develops counting skills, encourages turn-taking and group play, and promoting observation. Orchard Toys and Games are always really popular in our house - the colourful distinctive boxes make them stand out, and the children know the games are guaranteed to be fun. Parents love them because as well as providing hours of fun, every game inculcates a range of essential skills. A lovely new take on old favourites. Buy from Orchard Toys. Our second game from the Board Game Club was far more to our taste as a family than the first. We love games that really challenge us and make us think, and this succeeds admirably. Challenge your brain in a fun game that tests your thinking, memory and speed skills! There are eight different challenges and the variety means players need to use many aspects of brain power. There are coordination, touch tests, duplicates, frequency, logical series, memory, mazes and colour puzzles; the symbol on the back of the card means you know what the next challenge is going to be. Cortex Challenge builds on the popular fast-paced approach from Esdevium Games popularised by Dobble and Jungle Speed! The really well made texture cards that are used during ‘Touch Challenges’, where players must guess what they are feeling, adding a new dimension to the game; one which is often overlooked when games are designed. Can you be the first to match symbols, correctly remember all objects on a card or find the route out of mazes, and then put your hand down over the relevant card? Winning challenges allows players to add pieces to their brain puzzle which they must complete before their opponents in order to win the game. Cortex Challenge is sure to tax the mental abilities of players both young and old and it's a great way to develop essential skills such as memory, shape identification, logical thinking, coordination and puzzle solving, The game is suitable two to six players of 8+, making it ideal as a game for the whole family to enjoy together, although the younger end of the age range may need some help, especially initially. We played with four players, which seemed just about right. It puts quick reactions to the test, both mentally and physically. A super addition to the games cupboard, especially for competitive families. Drumond Park can always be relied on to bring us fun and innovative games that bring the whole family together and their latest release is no exception. There's no lengthy hanging around while the game is set up (there are stickers to be attached) and the rules explained - the game is quick to set up (just set the mechanical shark’s mouth to fully open and place the 12 pieces of yummy Fish Food into the holes within the gaping jaws) and the rules and objective very simple - can you save your catch before that big old shark snaps his jaws closed? When it’s your turn, a roll of the dice determines how many fish you have to catch, and using your fishing rod, it’s time to rescue the fish from the shark. If you drop your fish, keep dipping your rod in, until you hook the fish the whole way out of the shark’s mouth. But watch out...the shark can snap his jaws shut at any moment and then you lose all of your catch! There's just the right amount of tension for young players to enjoy - the game is suitable for ages 4+. Play continues round the table until there are no fish left inside the shark’s mouth. It's a game that will be played over and over again and it's simplicity makes it eminently for children to play without adult supervision. Another fun new family game for Autumn 2017 from Drumond Park. There's no hangi ng around with this game, as everyone plays at the same time. Suitable for up to four players age 8+, who vie for supremacy as they frantically scoop up and bounce a multitude of coloured ping-pong balls towards the King Pong cube - using one hand only! Great to develop manual dexterity. It's a super ice-breaker for parties and family get-togethers. The aim of this fast-paced game is to get rid of your five coloured King Pong balls as quickly as you can - by bouncing them into the plastic cube faster than they can roll back out into your tray. All the players racer to fling their balls onto the table so that they zoom through the holes in the sides or the top of the cube. The problem is, you are racing against the randomising pyramid within the cube which pings the balls back out into your tray. It's definitely one of those games where practice makes perfect, and we soon found we were building in a strategic element so our opponents' balls were thrown out; be warned - it's highly addictive, as you strive to complete the game ever more quickly. And in case you want some variety - each player’s balls are a different colour so that you have the added option of inventing your own rules and extending the game play should you so wish. Fast moving family fun that very quickly engages all the players. Everyone is familiar with the game of Dominoes - but if you want to take the concept one step further, this is the game for you. The aim of this family-friendly game is to become king of your domain by connecting your dominoes strategically to build the most impressive realm. You need to explore the various terrains in order to develop the best territories. But watch out, because the other players will do their utmost to stop you. Each turn, you try to connect a new domino to your existing Kingdom, making sure at least one of its sides connects to a matching terrain type already in play. There's an unusual method for obtaining the tiles - the order who of who picks first depends on which tile was previously chosen. You need to try to secure tiles with crowns, as these help to multiply the worth of your Kingdom at the end of the game. The game ends when each player has completed a 5 x 5 grid. It's great that there is also a longer version of the game where the players are challenged to complete a 7 x 7 grid. Points are counted based on number of connecting tiles and crowns. King domino has been nominated for the prestigious Spiel des Jahres - Game of the Year award 2017. Kingdomino is suitable for two to four players, age 8+; the game takes around 15 minutes to play. The playing pieces are made from really thick card, meaning they sit well on the table and stay in place The rules are easy to understand and the game is really good for a mix of ages. Great fun. Beware! This game is highly addictive - and if you see someone else playing, you are very likely to want to have a go yourself! There are 13 colourful shapes which can be put together in a huge variety of ways to make dozens of spatial challenges - it's a great way to develop spatial skills and to keep that brain active, maybe in a different direction to usual. Once you have tipped out all the shapes, the first challenge is to try to fit them all back into the tray - it's not as easy as you'd think - and there are 18 different ways for you to discover. Then use the blocks to build 20 different objects - these are all pictured in the accompanying booklet. And for the ultimate challenge, construct a 3-D cube. Hours of entertainment with this unique 3-in-1 puzzle. It's nicely made, enjoyable to play with, and the tray comes with a lid to keep the pieces together - it's a good game for travelling. You will be glad to know the puzzle comes with a solution booklet; recommended age is 8+. Hours of entertainment in one neat fun package. This is another game which requires strategic thinking - I far prefer this to games that rely purely on luck; as players become more familiar with the game, their skills increase and the game continues to offer plenty of variety. The little sheep are feeling very crowded in their pastures so the set out to conquer the world – one pasture at a time. To play, the players take it in turn to lay out the pasture tiles, each of which has four hexagonal areas; new tiles added must touch previous ones on at least one side. The rules are simple and easy to follow and the objective is to be the player who occupies the most spaces on the pasture. To start, each player places his stack of 16 sheep on an outside hexagon; the sheep are lovely heavy plastic discs and every sheep is different (their expressions are gorgeous!). Then it's time to move the stack in a straight line as far as possible before meeting another sheep or the border. The winner is the person who has their sheep on the most tiles. The game takes around 15 minutes to play, is suitable for two to four players and is ideal for age 7+. It's a really fun game for all the family to play on equal terms.! Our family was very excited to receive our first game from the Board Game Blogger Club, which is a great way to get families trying out a range of different games. Sadly, I must confess that my initial impression of this game was not great enthusiasm - there are enough problems in the world, without playing a game that is based on disease. I appreciate that this is a very personal view, and I am sure others will not have the same view - and the game proved to be very engrossing. Setting that aside, the purpose of the game is to keep four deadly diseases at bay whilst working to discover the cures - so that is a positive approach. The set includes a Game board, seven role cards (with matching pawns), six research stations, six wooden markers, 96 disease cubes, 48 infection cards, 59 player cards, reference cards plus an illustrated rule book. The game is for 2 to 4 players - we played it with 4, which worked well, with plenty going on to keep everyone completely engaged all the time. The rules are easy to follow and there's no lengthy setting up. The game board shows several major population centres on a stylised map of the world. During their turns, players can use up to four actions to travel between cities, treat infected populaces, discover a cure, or build a research station. A deck of cards provides the players with these options... but the danger comes with the Epidemic! cards that accelerate and intensify the diseases.. A second, separate deck of cards controls the 'normal' spread of the infections. This is a game of strategy and team play, and fast reactions are required to beat the diseases before time runs out. There is only one way to beat Pandemic: and that is by curing; conversely, there are lots of ways to lose so the game has a real element of tension; players must really be on the ball to identify all the possible dangers. What sets this game apart is the fact that players need to cooperate to beat the diseases and this gives the game a whole different vibe. You really do need to think hard throughout the game and it's a great way to develop strategic thinking skills - and we found the game plays out very differently each time, so you'll never get bored. It's a well made and well designed game and the collaborative approach ensures it is good as a family game. The game was provided to us free of charge by the Blogger Board Game Club in return for an honest review. Hone your parking skills with this fun game from Smart Games. There are 60 challenges in Parking Puzzler, so plenty to keep you occupied. This unique deduction game means players must find the right spot for each car using the clues and directions provided in the challenges. No illegal parking is permitted! Cars parked in the driving lane or taking up two spots will not be issued a license to move to the next challenge. The multi-level challenges are what make these games stand out - there is enough challenge for both children and adults. Our family love them - from the 6 year old to adults, they are really addictive. We are also really impressed with the quality of manufacture - the games are so well made and a real joy to use. For young and old alike, Parking Puzzler will help keep the brain active in a fun way. To get from one temple to another, there need to be roads and bridges - and you need to build them! Can you solve this ancient mystery and place the right roads and bridges on the board to create paths that connect the beautiful temples? Work out which floors to connect and which puzzle pieces you need to solve the 80 challenges! The difficulty level increases as you work through the challenges, so if you think they are easy to start, you will soon be puzzling over the harder levels. The 80 levels make the game really good value as it will take quite a while to work through. It's brain teasing fun for the whole family - we found it surprising that sometimes one of us can whizz through the early stages, yet another person can be still slowly puzzling over the first challenge! Planning, spatial insight and problem solving skills will all be refined whilst you are having fun with this game. For Ages 7 to adult. As with all Smart Games, there is an excellent instruction booklet which, in this case, takes players through five levels from Starter to Wizard. Perfect for travelling and ideal for out and about, the neat travel case is really well thought out to keep the game safe. With multiple levels of brain teasing fun! SmartGames new IQ-Puzzler Pro features 120 challenges in three playing modes, including both 2D and 3D challenges! This will really stretch players' skills and give them plenty of challenges and variety to keep interest high. The top of the game board features a grid for 2D challenges and a separate grid for 3D pyramid challenges, while the bottom of the board features a completely different 2D challenge grid. It's amazing how many challenges are found in this neat box, and again, the variety in levels is a real plus; I love the bright colours too. It's suitable for ages 6 to adult - you may want more than one to keep everyone happy! You can see the whole fabulous Smart Games range here. Orchard Toys have a superb selection of games, all of which help children's learning in various ways. Magic Maths is a new game which really focuses on helping children develop maths skills in a fun way, supporting the National Curriculum requirements for KS1. The game has been designed specifically for KS1 maths in collaboration with teachers and educational professionals, so you can be sure it is exactly at the right level. Magic Maths is an exciting and spellbinding maths game for children aged 5-7, based on Orchard Toys' Magic Cauldron game. Players take turns to solve the sums and fill their boards with yucky spell ingredients, from worm-infested cupcakes to brains and bogies - perfect to appeal to young ones! Once players have worked out the answer to the sum, the magic begins...by turning over their card and rubbing the heat sensitive patches to reveal if their answer is correct (the number soon becomes obscured again!). Addition, subtraction and multiplication skills are used to offer a challenging game. Featuring competitive gameplay, fun wizard characters and a broad range of simple and challenging sums, this is a really well designed and fun game with excellent educational benefits. The playing pieces are colourful and durable and the game would be great at home or in school. The game is for up to four players - or two could play with two boards each. Even if your child doesn't enjoy maths, I am quite sure they will enjoy Magic Maths. Buy from Orchard Toys, price £12.00 (May 2017). With 60 multi-level challenges, (starter, junior, expert and master) the Smart Penguins will keep puzzlers in the one player game busily engaged for quite some time. The challenge is to place the penguins in the water on the beautifully illustrated game board as shown in each challenge and then to fit the ice blocks around them. Ideal for travel, this game helps stimulate spatial insight, planning, problem solving, concentration and visual perception. It comes in a neat plastic box which holds all the pieces; they are attractive, well made and enjoyable to play with. I think children might struggle a little to open the box initially - it is quite tight-fitting. If you get stuck, all the solutions are in the instruction book, which is where you will find the 60 challenges laid out. As well as an enjoyable game that will develop thinking and reasoning skills, players will also discover a new world of Asian animals. Your challenge is to hide the animals not shown on your challenge and leave the others visible. With 80 challenges and a double-sided game board, Hide & Seek Jungle is like two games in one: the day side features a 4-grid game and the night side features more difficult challenges in one big grid; I love this dual aspect to the game which makes it great value with appeal to a wide audience - well worth its place in the holiday packing It is recommended for 7+ up to adult.There is a real sense of achievement as each challenge is completed. The game includes a double-sided game board which can be used as a storage case, 4 double-sided puzzle pieces and a booklet each for day and night, with a total of 80 challenges and solutions. It's really attractively made with lovely colourful playing pieces which are a joy to handle. Be warned - it is very addictive! Keep the fish in the water and the polar bears on the ice with this single player game, for six years plus. This new brain game features two playing modes: one with the Eskimo in a canoe on the water and one with the Eskimo on the ice - use one at a time. Play the same challenge twice and discover a completely different solution, giving endless variety and ensuring the game stays fresh. North Pole Expedition includes 80 challenges for endless, brain-building fun. Includes a portable, self-contained game board, 7 puzzle pieces, 20 cards with 80 challenges and a booklet with game rules and solutions. It's definitely best to start at Card 1 and work through methodically to get the most enjoyment. The challenges are simple to start with but soon increase in difficulty. As with all Smart Games, this is a beautifully made puzzle, with lovely game pieces which are a joy to use. The cards all store in the box, along with the playing pieces and instruction booklet. Make use of the opportunity to talk about the North Pole environment too. It's brilliant to see that this game is aimed at pre-schoolers. They will, of course, love the fairy tale theme, and as they play, they will be developing key skills. Their task is to help Little Red Riding Hood find the right path to her grandma’s house. To play, place Little Red Riding Hood, the house and the trees on the game board and use the puzzle pieces to make a path to Grandma’s house. But don't forget the big, bad wolf! Will he get there quicker? Try to solve these challenges by making two paths to Grandma’s House, one for Little Red Riding Hood, and one for the Wolf. Little Red Riding Hood includes 48 challenges (24 with the Wolf and 24 without) also features a family friendly picture book with a modern twist on the original story; these reworked fairy tales are always popular; it's also a great idea to encourage your child's creative writing by asking them to put their own spin on a fairy tale - and this game may well inspire them. The playing pieces are charming, and children will love them. This is an excellent way to develop early reasoning, logic and thinking skills and the 48 challenges increase in complexity, giving a real sense of achievement as children progress through the game. Mrs. Plumpert's prized pot pie has gone missing and it's now a chicken chase to crack the case... and it's up to you (and the other players) to catch the culprit.It's a great game for cooperative play, because instead of working separately, as in Cluedo, for example, players work together to solve the mystery before crafty Fox escapes; it's a good way for younger and older players to work together and older siblings will respond well to the opportunity to help younger ones. The set-up and rules are clearly set out on an illustrated sheet which is good for younger ones to follow; it's easy to set up and start playing and the average playing time is around 20 minutes - just right for younger players. What do you have to do? You must stop the hungry hooligan before it flies the coop... but will he get the better of you? Players will need all their deduction, visual discrimination and cooperation skills to outfox Fox. As players work together to try and nab the guilty fox, they’ll learn some valuable skills such as estimating probability and paying attention to details, as well as the important role that collaboration plays towards problem-solving. It is suitable for 2-4 players aged 5 and above. It's a well made game that is a pleasure to play with; the sturdy heavy card board is nicely illustrated and folds into four to fit the box. All the playing pieces and cards are equally well made. We really enjoyed the strategy element of this game - it makes the players think but without being too challenging; it's the ideal introduction to strategy games, highly enjoyable to play and refreshingly different from the average game. A new family favourite. I love these mini games from Orchard Toys - they are perfect to take when out and about, for holidays, travelling and visiting, or just to keep in the car for those times when you are waiting around. Llamas in Pyjamas is ideal for children aged 3-6. It is an exciting race against time as players must build as many llamas as possible before the sleeping llama picture is completed. The llama characters are really cute and children will love them. It is basically a matching game, as players have to match the top and bottom halves of the llamas, with bedtime scenes and clock faces to add variety. The winner is the one who has the largest number of complete llamas once the bedtime scene is complete. The colourful cards are well made, on strong card which will last through many games. Playing games is an excellent way to learn key skills, including taking turns and cooperation; this particular game develops memory and matching skills and observation. Buy Llamas in Pyjamas from Orchard Games. Price £4.99 April 2017. This is a colourful mini beast bingo game for ages 3-6. Children of this age will often be learning about mini beasts at school so they will love to show off their new-found knowledge as they name the bugs; the game will also be fun to use in the classroom and all the mini games are such good value that teachers will love them. This fun matching game features a variety of familiar and less familiar bugs and insects for children to identify, from ladybirds to water boatmen. The first player to fill their board with leaves and shout 'Bingo' is the winner. Playing games is excellent for developing social skills, for learning to take turns - and learning to lose! Perfect for travel, at home or on holiday, the mini games are Orchard Toys' smallest games in a compact and portable size. The mini games also make the perfect under £5 pocket money toys, birthday gifts and Christmas stocking fillers. They are excellent value at £4.99 each, so you can build up a good stock of different games, meaning children always have a good selection from which to choose. Buy Little Bug Bingo from Orchard Toys..
52 Card Game Rather like the books which allow you to make decisions along the way that affect the final outcome, Cardventures are interactive stories that put you in control of the outcome. The difference is that the challenge of the game is to score the maximum points available. In this exciting game, you have stowed away on board an alien ship that's about to attack Earth - and it's up to you to stop it. Choose any card at random, read the short extract of story then choose one of two ways to progress the story. The aim is to use up as many cards as possible before reaching a dead end/the end of the story. As you go, you will also collect Items cards; the value of these is added to your story cards and the highest scorer wins. Just like the books, it is an excellent way to encourage children's reading in a fun and interactive way, helping to develop language and vocabulary development skills. The game is suitable for ages 8 and above, for solo play or with friends, with a duration of around 15 minutes. As the captain of the Black Bounty, it's up to you to chart your own course through this pirate Cardventure. It's decisions all the way - should you defend your boat from enemy pirates, or do you go and plunder another ship? Do you duel your fearsome nemesis Captain Peg, or do you jump into the squid-infested waters? Choose wisely - your fate depends on the choices you make. The cards fit neatly into a sliding drawer in the pack; this neat package with its well designed cards is perfect to take out and about, perhaps to enliven long journeys or to play on holiday. The game only takes around 15 minutes, although as players get wise to the options, they will learn to take the course which lengthens the game and the eventual score - this is a good way to enhance memory and strategy skills. It is also a very good way to encourage creative writing skills (the cards would make great classroom writing prompts). I would love to see more titles in this series, which I think is an excellent concept - fun to play and great for developing a whole range of key learning skills..
Like all Orchard toys and games, these flashcards are well made, with sturdy shiny card, rounded edges and bright colourful illustrations. These combine to make Alphabet Flashcards an ideal way to make the introduction of letters of the alphabet and first words fun and enjoyable for children. The cards are double-sided with ai picture of the word on one side and the letter of the alphabet on the other. The range of words on the flashcards is good, with a wide range of simple and complex words, ranging from ‘ant’ to ‘umbrella’. It is recommended that the cards can be used with children from the age of three to seven, but I think they could be used effectively with younger children to start word recognition and to encourage conversation. Alphabet Flashcards are incredibly versatile and can be used in a variety of different ways to develop children's literacy skills, from teaching children the letters of the alphabet to whole words; parents will, no doubt, find their own ways to make really good use of this set. The cards also feature a handy visual alphabet guide. Depending how you use them, and the versatility is a good feature, the cards will promote language and literacy skills, develop letter and word recognition and encourage conversational skills. Buy from Orchard Toys. The whole family will enjoy Cheeky Monkeys. It's a fast-paced game with no hanging around as players battle to see who can collect the most bananas – but watch out for other players trying to steal them! Designed for children aged 4-8, this game of chance encourages children to think strategically and make decisions; this is a valuable skill and children will be having so much fun, they won't realise they are learning. in at every turn, as players must choose whether to play it safe after their first turn or spin the spinner to either collect or risk losing more bananas! The innovative design of the 3D tree and hanging monkeys adds another fun dimension to the game! It's easy to set up and play, and children will learn to think quickly, learn counting skills and develop hand-eye coordination." In January 2017, Cheeky Monkeys joined the ranks of Orchard Toys' award-winning games, winning a Best New Toy award at the London Toy Fair in the 'Games' category." This is well deserved, as the game offers lots of fun as well as educational value; we like the fact that children are just as likely to win as the adults. Buy your game from Orchard Toys. This is the perfect progression from Orchard Toys’ bestselling, award-winning Match and Spell. It is suitable for children aged 5 and over, and the game helps to develop more advanced reading and spelling skills using both sounds and blends. The game is played by building a variety from 18 familiar and more advanced words, which include flower, moth, balloon and queen - each illustrated with an appropriate colour picture to help identify words. Parents can use the sound and blend cards to encourage children to make the individual sounds as well as saying the entire word aloud; it's useful for parents to have this guidance with blending so they can be sure they are doing this correctly. The game develops progressively as once children become more confident, they can turn over the boards to use the blank side for a more challenging game. Spelling can be seen as something of a chore, especially the regular spelling from school, but this is a fun way to make developing an essential skill really enjoyable and well as making the spellings easy to remember. As children play the game, they will also be developing their memory and observation skills and parents can make the most of the opportunities offered for discussion. A fun game that builds excellently on the earlier game. Buy from Orchard Toys. We all know how important it is for children to have the opportunity for plenty of physical activities, and this enjoyable game is a great way to get the whole family to become more active, as well as encouraging them to work together. The first thing you will notice is the neat packaging; the spinner is part of a plastic box which neatly holds the cards and rule book. It is really simple to play - just spin the spinner, pick a Yoga Pose Card (there are 54 in all) that matches the colour it lands on and then hold the position for 10 seconds (it would be good if a timer was included in the game). The first to collect a card of each colour is the winner. Yoga Spinner is very reminiscent of the classic game of Twister, but it takes it a step further with players exercising both mind and body. There are so many benefits to be gained from this game - it will help to improve balance, posture, flexibility and coordination. The practice of yoga can calm and clear the mind to prepare it for optimal learning and this is a fun way to introduce yoga at a young age to nurture children's in a fun activity which can have lifelong benefits. The game is enormous fun to play and will give children a really positive view of yoga. Suitable for everyone aged 5 and up, there really are no benefits coming through age - children are just as likely to do as well as adults. It's easy to take Snakes and Ladders for granted but this popular childhood game is an excellent way to develop numeracy skills as well as teaching children about taking turns and accepting that things don't always go right. This giant-sized floor version has a plastic mat which gives a playing area of 80 x 80cm; this super-size makes a really visually attractive game as there is lots of space for pictures of Peppa, her friends and family. The durability of the playing surface even allows children to play the game outside. There are four colourful playing counters, which are a good size and stay in position well - choose your favourite from Mummy Pig, Daddy Pig, George or Peppa Pig. I won't describe the rules, they are far too well known but just to say that the first player to reach Peppa Pig’s House is the winner; there are just 50 squares on the mat which makes for a reasonably quick game for young children - it saves it dragging on too long. A great way to introduce a classic game. I do loves games that come attractively packaged and this game, in its triangular bright red metal tin, is very appealing. Inside the tin are rule books in several languages, and a set of cards along with tokens. It's perfect for travel, with its compact tin. The aim is to match the fruits to a number, or numbers to a fruit; you won’t know what match you’ll have to find until the next card is flipped! Whether you play with the tokens or with the cards alone, players need to think and act quickly to make a match; the game offers three different modes of play in all. The magic distribution of fruits on the cards guaranties that there is always one correct answer. Playing games is a great way to develop a range of key skills and this fast-moving game enhances visual perception (recognising shape, size and colour) and processing speed, and demands total concentration. The game is suitable for two to eight players aged 7 and above with a playing time of around 15 minutes, making it perfect for when you want an enjoyable way to happily occupy a short period of time. It's eco-friendly too - Blue Orange plant two trees for every one used in the making of their games. This is a real ice-breaker - I defy anyone to keep a straight face when playing this hilariously silly game. Everyone will have tremendous fun with this game and there's no use being shy - just forget any worries and get into the spirit of the game. The game includes four pairs of glasses and play starts by donning a pair each.Then the dice is rolled and whatever comes up - nose, eyes, ears or hat - players race to be the first to the appropriate card. They get to choose one of the appropriate colourful cardboard appendages - but they don't put it on themselves. Oh no - the fun is that they hang it on the glasses of whichever opponent they choose! There are two sides to each card, so there are lots of combinations that can be made. Stoopitoot brings even more fun to the game. As play proceeds, players get to look more and more ridiculous, much o everyone's amusement. Children will be especially gleeful as they see their elders (and betters?) looking more and more silly. The game ends when there is only one player left with an incomplete silly face. The game is simple to set up and play, so children can happily play on their own. It's all good family fun and is great for bonding. You can get some great pictures for the family photo album too! This is a fast-paced game of frantic finding fun which children and adults can play on equal terms. Players have to be the first to find their six pieces in the bowl full of different brightly coloured plastic pieces (128 in all) which include teddy bears, frogs, rockets, houses, ice creams and many more. It's quite a challenge, with 32 different items in all, as you have to match object and colour according to your cards. The wide range of pieces is very appealing and I think other games could be made up using them, too. There are two ways to play - the cards are grey one side, so you just have to match object, not colour; the other side has coloured objects to match - you decide at the start which way to play and it's good to have the variety. When the neat push-down timer is pressed, players have 15 seconds each to search. Once the time is up they make way for the next player. The good thing is that, even when your turn is over, you need to keep watching, looking for that elusive final piece or two, so there's no sitting out feeling bored. When the final bell goes it's a frantic free-for-all as you jostle for space and grab for your items before they are stirred into the mix again. Fast and frenetic, it's great fun for all the family and guaranteed to bring out the competitive streak in everyone. It's a good way to encourage memory and observation skills, too, as you need to keep an eye on the bowl while others are delving, to see if you can spot your missing pieces. This brand new game, based on the phenomenally successful Bananagrams, is designed to help increase young children's vocabulary and letter recognition. Suitable for ages 4+, this version differs from the original in having lower-case letters (these are what children will initially learn at school) and coloured tiles, designed to make it easier for mini-wordsmiths to race to complete their word grid. The tiles are variously coloured, with all the vowels light orange; letters commonly reversed by children have distinct identities through the letter shape and the tile colour - a very useful feature. What really sets the game apart from other word games from the age are the double letter tiles which feature common digraphs such as ai, th and wh. Almost all children will learn to read and spell using phonics so this ties in perfectly with the curriculum - my 5 year old tester immediately spotted these. The basic game involves players (1 to 4) taking 15 single tiles and trying to use them all in a grid; tiles can be swapped. The advanced game includes the double-letter tiles; it's really good to see that a wide range of abilities is catered for (the two levels can be played together). amongst siblings and pals, Before children are ready for this, though, they will love the collection of 10 curriculum-based mini games which are designed to become more challenging, as confidence and vocabulary grows. I promise you that children will just think they are having fun, while in fact they are really reinforcing key skills; it's a brilliant way to learn and as the games progress from pre-schooler, through early reader and onto reader children will really gain knowledge of letters, words and spelling. It's extremely enjoyable to play and children love the challenge of making sure other players have got their spelling correct. I was impressed with the 10 games, which really do tie in with the curriculum and with the way children are taught. The game comes in, of course, its own banana-shaped pouch, which smoothly zips up to keep the tiles safe - it's ideal for travelling and visiting. It's well made, too, with the letters clearly standing out above the plastic and there's no paper to rub off so the tiles are really durable. The emphasis is on fun and My First Bananagrams will give hours of enjoyable learning; perfect for home and classroom. It's been really well thought out and excellently presented. As adults, we can forget how challenging it can be to learn to tell the time, especially as we use two totally different types of clock. This board game from the excellent Orchard Toys will help children develop both analogue and digital time telling skills, whilst enjoying a fun game. There are two game levels, which is good to see, and this makes the game suitable for children between the ages of 5 and 9. It's simple to set up - join together the jigsaw-type playing board and players' cards, and attach the hands to the clock face. The clock is a good size and the times are clearly marked. Now players must race their character around the board matching the times to the central clock – but watch out For Mr Wolf; it's ALWAYS dinner time for him! The second game requires players to match the digital or written times to the clock faces on each player's collection board. I really like the way this game addresses the different methods we use to tell the time, helping children to relate them to one another. The illustrations are a really good point about the game - they show a range of cute woodland animals enjoying all sorts of activities; the playing pieces are animals too. It's well made, on thick card and with pieces that easily pop out before first use. The game really does help to consolidate the learning of the different ways of telling the time, and if adults play along with children, there's plenty of opportunity to extend this key learning. Like all games, it encourages interaction, taking turns and concentration; it also encourages visual recognition and matching. All this, and children are thoroughly enjoying a fun time! An excellent game to help with an essential skill. Buy from Orchard Toys - and look at all their other super games too! The objective of the game is to be the first one to place all your playing cards onto the roadway. Each player starts off with five cards, and one is placed on the table to start building a road by matching either the colour or the vehicle - but watch out for roadblocks! Other players may put down a police, roadworks or flood card to block the road. It's a fun game which is very easy to set up and simple to play - children of 3+ (Orchard Toys say 4+, but I found a 3 year old played it very well) will happily play together, but they always enjoy an adult playing along too. Playing games offers many educational benefits - but children just think they are having fun! This game helps matching skills, both colour and (slightly more difficult) the shape of the vehicle (each of the vehicles types is driven by an appealing animal character). Observation skills are developed too. There's an element of planning ahead with the game, which helps develop strategic thinking. As with all games, children are learning to take turns, play with others and develop conversational skills. The playing pieces are all very colourful and well-made in strong card. A fun game for children. Buy from Orchard Toys.